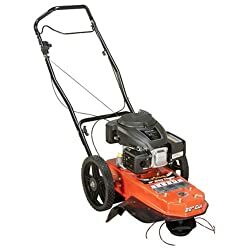 A wheeled walk behind trimmer is similar in appearance to a lawn mower. The main difference in appearance is that a walk behind trimmer has rear wheels only and no front wheels. Walk behind trimmers are perfect for the rugged terrain that a standard lawn mower cannot handle. Here are our top 7 picks for the best walk behind string trimmers of 2019. Walk behind string trimmers are becoming more popular. They are easier to maneuver than hand-held trimmers and can trim more lawn area in less time. With so many trimmers available, it is difficult to know which trimmer is right for your needs. We are sharing reviews below of our favorite walk behind string trimmers to help you with your decision. This Remington walk behind trimmer is powered by a 159cc MTD Powermore 4-cycle OHV (overhead valve) engine. It has a cast-iron cylinder sleeve, forged steel crankshaft, and ball bearings for longer performance. This walk behind string trimmer is ideal for large property owners. A folding comfort handle gives you flexibility to store the trimmer in a compact area when it is not in use. Designed with a 22-inch cutting path, this trimmer uses a standard 0.155-inch diameter trimmer line. It has an offset trimmer head feature which helps you reach the hard-to-reach places in your yard. The Remington trimmer has one of the widest cutting height ranges compared to the other trimmers we reviewed. You can adjust the cutting height from 1-inch tall up to 6-inches tall! A trimmer guard protects you from flying debris while you are using the walk behind string trimmer. The 14-inch high ball-bearing wheels make it easy to maneuver through rough terrain. 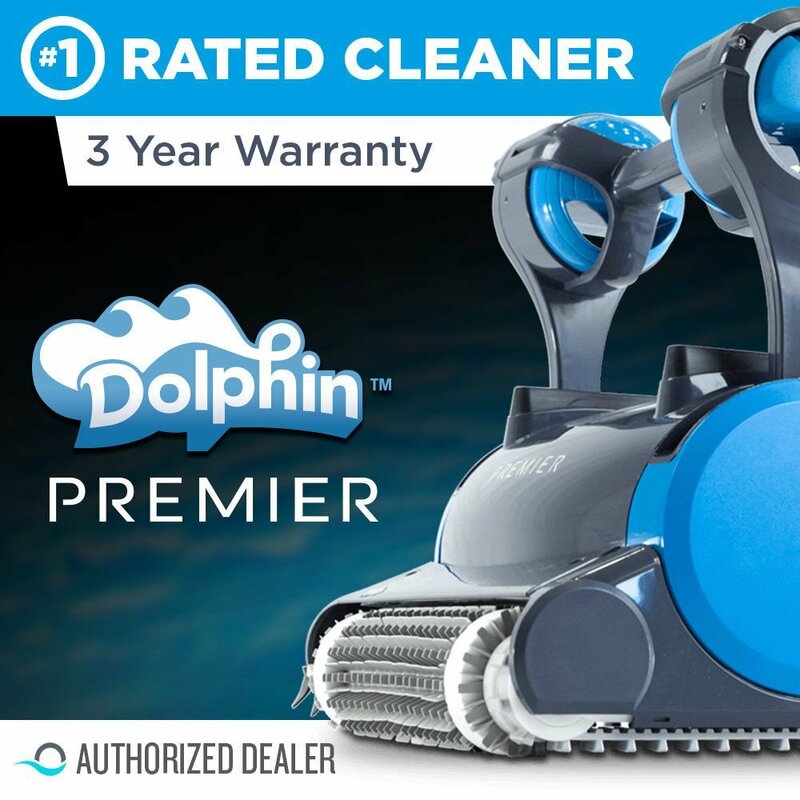 Remington backs this trimmer with a 2-year limited warranty. Husqvarna powers this trimmer with a 163cc Briggs and Stratton 625 series engine. It has a preset net power of 3000 rpm (rotations per minute). 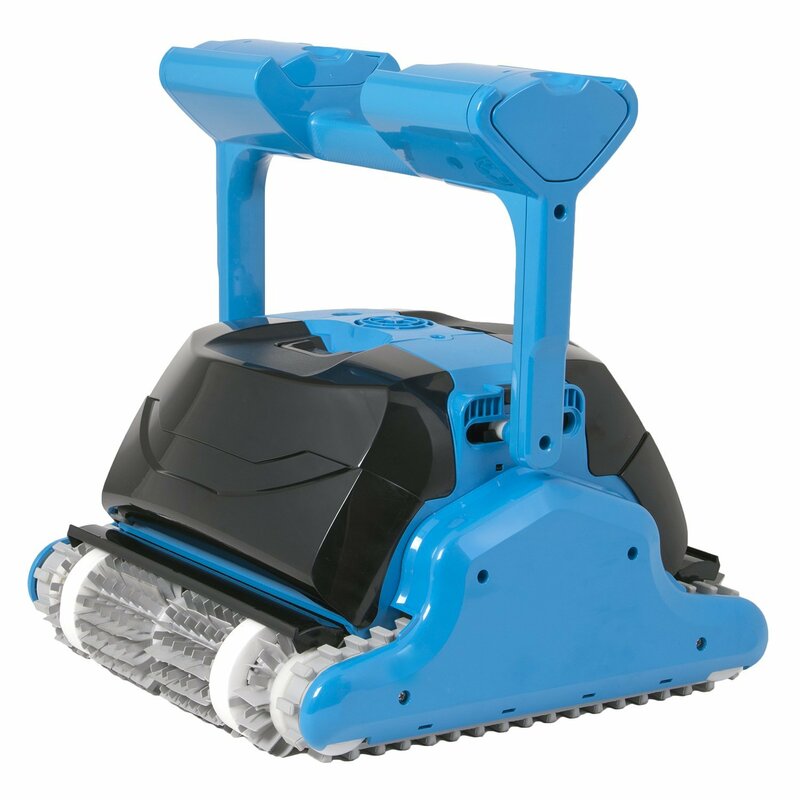 This trimmer has a push drive system with large 12-inch high wheels. This trimmer uses a rotating trimmer line and can trim a 22-inch path in your yard. You can adjust the trim height from a minimum cutting height of 1.6-inches to a maximum height of 3-inches. The handle height adjustment features allows you to fit the trimmer to your individual ergonomic preference. The throttle control near the handle bar gives you the control you need to adjust the power based on the area being trimmed. This trimmer has an auto choke feature that eliminates the need for manual priming or choking. 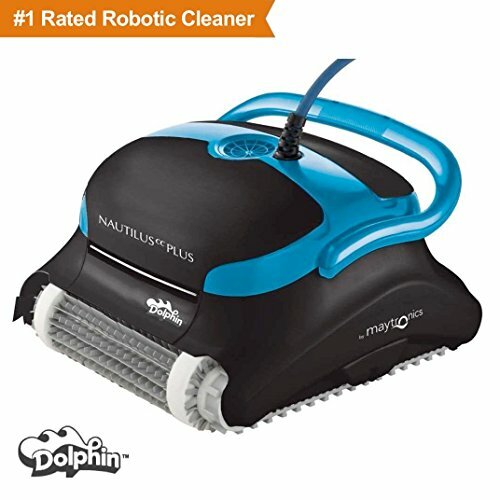 This makes startups for this trimmer fast and easy. The engine on this Husqvarna trimmer is a 163cc 675EXi series Briggs and Stratton with a net power of 3000 rpm. It has a push drive system and offers a cutting range height from 1.6-inches to 3-inches. 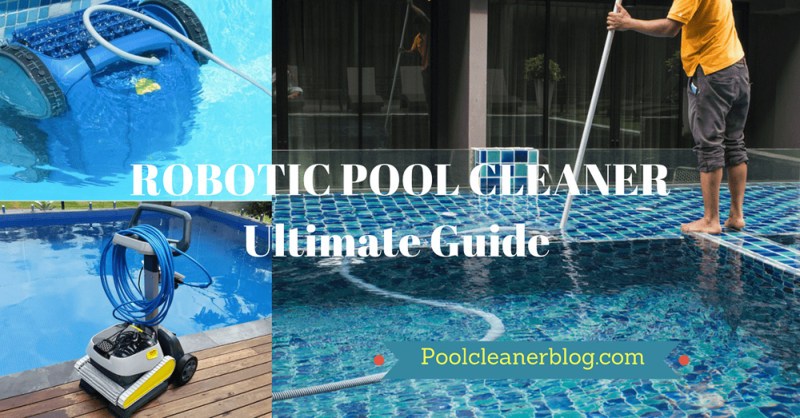 It uses a standard 0.155-inch diameter rotating trimmer line. The rear wheels on this trimmer are 12-inch high wheels which gives you enough power and control for any rough terrain. 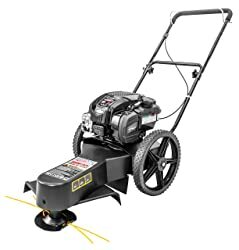 The 22-inch cutting path allows you to cover a large area of your yard in a small amount of time. 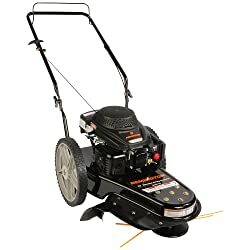 Husqvarna offers a 2-year limited warranty on this product which makes it a great choice to address all of your yard trimming needs. This trimmer is powered with a 150cc 5.75 foot-pound torque engine. It has a manual recoil east start fuel delivery system to make this one of the easiest trimmers to start. The 12-inch high rear wheels give you increased maneuverability through tough terrain. The trimmer mechanism uses four trimmer line sets. You get a wide 22-inch cutting path when using this trimmer. 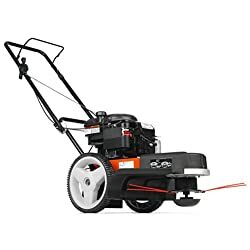 This gives you a wide cutting area which will reduce the overall time needed while trimming your yard. The anti-vibration foam comfort grip handle folds down easily for compact storage. This is an economic choice to meet your walk behind trimmer needs. 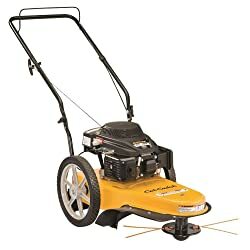 This Cub Cadet walk behind string trimmer offers a wide 22-inch cutting path. It has five adjustable cut height settings ranging from 1.75-inches up to 4-inches. This gives you flexibility for all of your trimming needs. The 159cc Cub Cadet OHV Engine gives this trimmer enough power to handle even the toughest jobs. With an auto choke system, it eliminates the need to prime the engine before starting it. 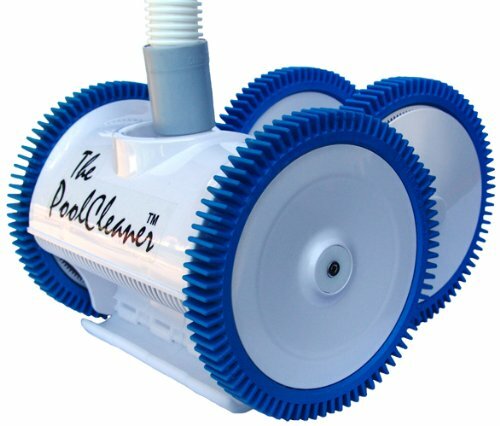 This trimmer has a debris shield on the deck to protect you from flying debris while you are trimming your lawn. 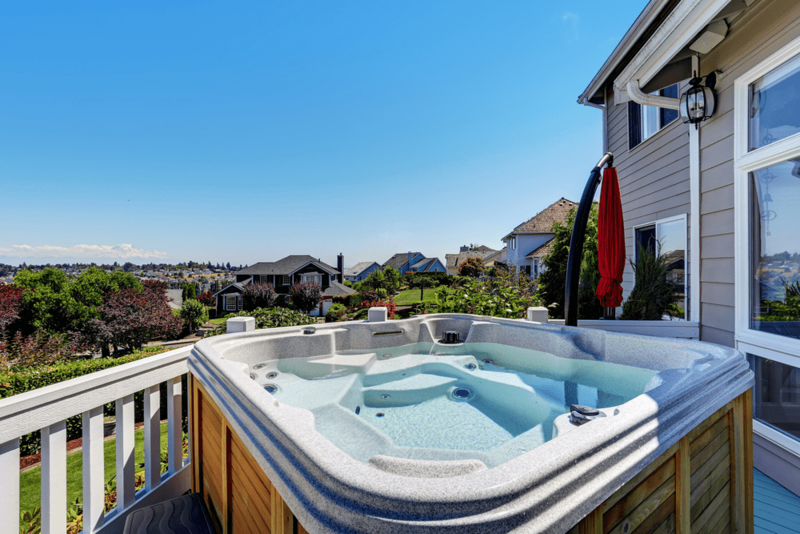 The unique deck design allows you to trim right up to the edge of any fencing or building so you can reach all areas of your yard. The 14-inch high ball-bearing wheels allow you to maneuver this trimmer through tough terrain. The handle folds easily for compact storage after use. With a full 3-year limited warranty, including the engine, this Cub Cadet walk behind trimmer is one of my favorite choices. 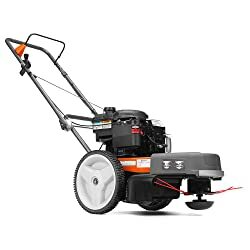 This Ariens trimmer features a 173cc Kohler XT-7 series 4-cycle OHV engine. An auto choke feature eliminates the need to prime the engine before starting it. The engine has cast-iron cylinder liners for extra durability. The trimmer has a 22-inch cutting path and uses four cutting strings. It has cutting height adjustments ranging from 1.25-inches to 4.25-inches. The folding handle allows you to store the trimmer in compact spaces when it is not in use. 14-inch high run flat wheels give you the flexibility to trim areas of your yard covered in rough terrain. This Swisher product has a 6.75 gross torque Briggs and Stratton EXI engine. The engine on this trimmer has an auto choke feature that eliminates the need to prime the engine before starting it. 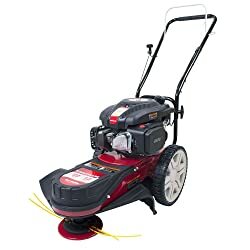 This engine has a unique check and add oil feature which makes lawn mower and trimmer oil maintenance easier than ever. This engine requires that you check the oil periodically and add new oil if it is running low. Briggs and Stratton claims the EXI series engines will never need an oil change! 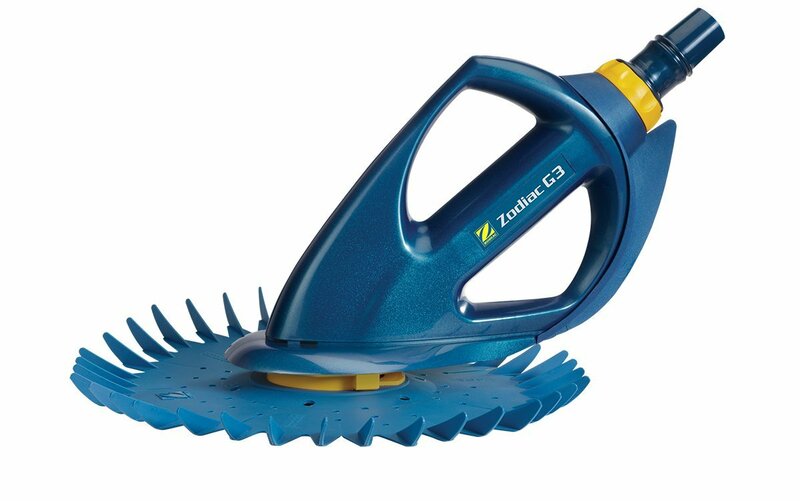 It has an extra-wide 22-inch cutting path and uses a standard 0.155-inch diameter trimmer line. The 13.75-inch high wheels give this trimmer the flexibility to navigate through any rough terrain area. If you are looking for a practical and economical walk behind trimmer choice, then consider this Swisher trimmer. There are many features you should consider before deciding which walk behind string trimmer is best for your situation. 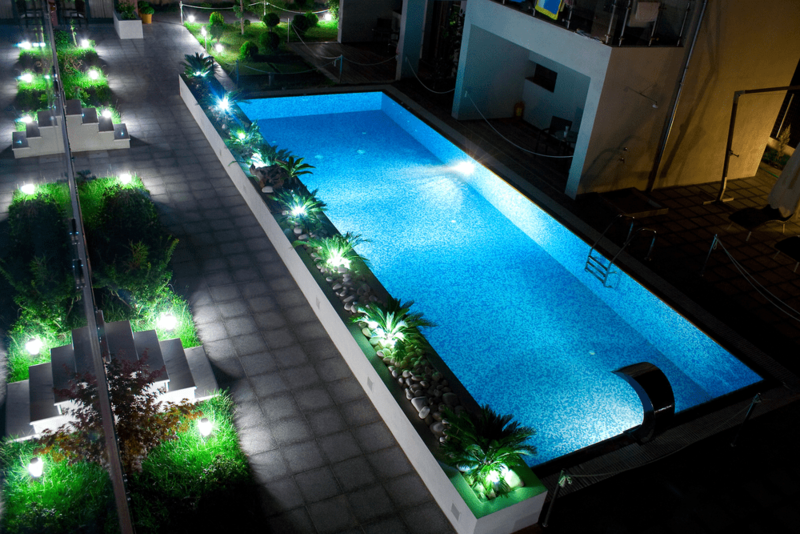 We are providing you with some guidelines below to help you make an informed decision on which trimmer is the best. A hand-held string trimmer, also known as a weed wacker, is perfect for smaller areas where tall grass is hard to reach with a regular lawn mower. A hand-held trimmer is not practical for large amounts of space, however. This is where a wheeled string trimmer comes into the picture. Some areas of land are difficult to reach with a lawn mower or lawn tractor. Wheeled trimmers give you more flexibility to cover large, hard to reach spaces. The wheels give you the ability to maneuver across rough terrain and can trim down weeds that are extremely tall. Engine size is an important consideration, especially if you need more power to cut through an expansive area of tall weeds and brush. Most walk behind string trimmers have a 4-stroke or 4-cycle engine. They need oil changes and basic maintenance to keep them in good operating condition. Briggs and Stratton makes an engine they claim requires no oil changes. If you are not a mechanically inclined individual, then you will want to consider an engine that needs little maintenance. Most wheeled string trimmers have engines that come with a recoil starter that has to be started by a starter rope. This turns the engine over and gets it started. It is best to find a wheeled string trimmer that includes an auto choke feature which eliminates the need to prime the engine ahead of time. The wheels on walk behind string trimmers are made of hard plastic or Never Flat material, which means it is not likely you will need to handle a flat tire. Walk behind string trimmers that have larger wheels can maneuver over rougher terrain. For maximum flexibility, you want to find a wheeled string trimmer that has wheels at least 12-inches high. When using your walk behind string trimmer, you want to be as comfortable as possible. As you maneuver the trimmer, you may go over potentially rough terrain. Since most walk behind string trimmers have push drive engines, you want the handle grip bar of the trimmer to be at the right height and angle to minimize strain on your back while pushing. Be sure the trimmer you choose has an adjustable handle height. The handle should also fold down for compactness while you store it and it is not in use.. Finally, you want a wheeled string trimmer that has an anti-vibration feature. This will reduce the tingling in your hands, arms, and shoulders after you have finished using the trimmer. Most walk behind string trimmers have a 22-inch wide cutting path. 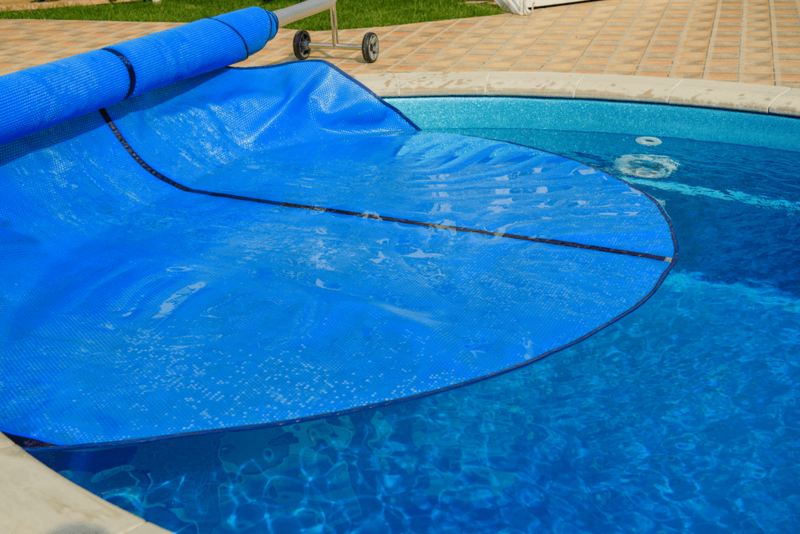 This allows you to cover a large area of grass in a matter of hours instead of days. You should consider a cut height adjustment feature when choosing a walk behind trimmer. This allows you to adjust the height of the remaining grass or weeds left behind after you trim the area. If you need to leave a few inches of grass or weeds standing after you trim, be sure the trimmer you are interested in buying has an adjusting cut height feature that will accommodate the height you need. After reading our product reviews and guidelines, you should have enough information to make a well-informed decision on a walk behind string trimmer. Remember to consider the area you will be trimming. Select a trimmer with the right engine power, maintenance needs, cutting height adjustment range, wheel size and overall comfort. You will be able to select the right option to fit your specific needs.